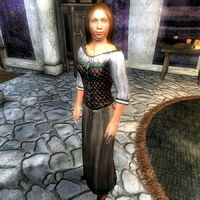 Mirabelle Monet is a Breton agent and the innkeeper at the infamous boarding house for sailors, The Fo'c's'le on the Anvil dockside. She is notorious for her promiscuous nighttime behavior and will not rent you one of her beds because they are, as she puts it, 'reserved for seamen'. She is also an advanced trainer in Sneak. Always busy servicing her tenants in every thinkable way, she rarely gets any sleep and because of a number of random factors, her daily routine is a complicated one. She will be at The Fo'c's'le every day between noon and midnight, mainly in the private rooms area, but also occasionally in the dining area. She finally leaves at midnight and takes a stroll down the dockside, actively seeking out one of her tenants, Krognak gro-Brok. In his company, she will watch the fight between Thurindil and Hauls-Ropes-Faster until 4am. At that time, most of the sailors retire to their rooms at The Fo'c's'le and Mirabelle will follow. Having a slight preference for Thurindil, she will most likely choose to sleep with him first, although Anguilon or Krognak gro-Brok could get lucky as well. Getting tired of her partner at 6am, she shifts beds and will sleep with either Anguilon or Krognak – or maybe even Thurindil if he wasn't her first choice. At 8am, she might get out of bed (if she chose either Thurindil or Anguilon as her second partner, she will sleep until 10am), leave The Fo'c's'le and take her breakfast at The Flowing Bowl. At 10am, she will enter Lelles' Quality Merchandise for a bit of browsing before it's time to return to her inn at noon. She will only offer training while spending time at the inn between 12pm and midnight. She wields an iron dagger and wears a set of typical middle-class attire, a quilted doublet with light brown linens and doeskin shoes. She carries the key to the Fo'c's'le, her own personal key and a small amount of gold. When you meet her for the first time she will introduce herself and politely deny you shelter for the night: "I'm Mirabelle Monet. I run the Fo'c's'le, a boarding house for sailors. Sorry, I reserve my beds for seamen." When asked about Anvil, she will give you a bit of fair warning about her residents: "Watch yourself around the Fo'c's'le. Sailors despise landsmen, and won't hesitate to treat them to a good beating when they're in their cups." As an advanced trainer, Mirabelle can provide you with the necessary reference to start the Sneak Master Training quest. Once your Sneak skill level reaches 70, speak to her, and choose the "training" option, which will trigger the quest and this dialogue about Marana Rian: "If you need more assistance with your training, seek out Marana Rian in the Imperial City. She uses the shadows like no other I've seen." Mirabelle's nightly excesses are a hot topic among the townsfolk of Anvil. When asked about rumors they will gladly tell you what they have seen and heard: "Mirabelle Monet is quite a woman. Ask any of the sailors down at the Fo'c's'le. ", "I've heard that Mirabelle spends a lot of time with the sailors. A lot of personal time with them. ", "Mirabelle Monet runs quite a boarding house. I understand all of the sailors leave very satisfied." and "I've heard a lot of stories about the Fo'c's'le. None of them good." This page was last modified on 22 June 2018, at 04:31.